Rebecca Bloomwood (Fisher) is a clumsy girl who funds her designer wardrobe with her credit cards and dreams of writing for the ‘Alette’, a Vogue-like glamorous magazine. But the only job Becky can fake her way into is at a financial magazine called ‘Successful Saving’. So successful are her jargon-free columns that she lands a TV spot and the love of her charmingly rich, but hard working boss Luke Brandon (Dancy). Based on Sophie Kinsella’s best selling novels, Confessions of a Shopaholic is designed to appeal to people who simply were born to shop and enjoy spending money without considering those disastrous consequences. Isla Fisher is luminescent. She is incapable of making a bad movie good but she makes it entertaining to watch anyway. Dancy does his level best in a thankless role. Ritter gives a decent performance as Rebecca’s roommate. The film’s supporting performances are mostly a mixed bag, partially owing to the cast and partially owing to not being given much to do. This brainless chick flick reinforces the worst stereotypes. Trying to disguise itself as a cautionary tale on the perils of conspicuous consumption, it fixates so much on materialistic cravings that it ends up doing just the opposite. The problem is that filmmaker P.J. Hogan (My Best Friend’s Wedding) spends so much time glorifying everything Gucci and Prada that by the time the film gets down to moralizing it feels misguided and vacant. It has moments of fizz and fun as it seesaws to the inevitable happy ending, but it is no more than a laugh-free time waster. After a rather tasteless adaptation of Dan Brown’s bestseller, The Da Vinci Code, director Ron Howard reunites with Tom Hanks for more international intrigue. This time around with a lot more action and less boredom. 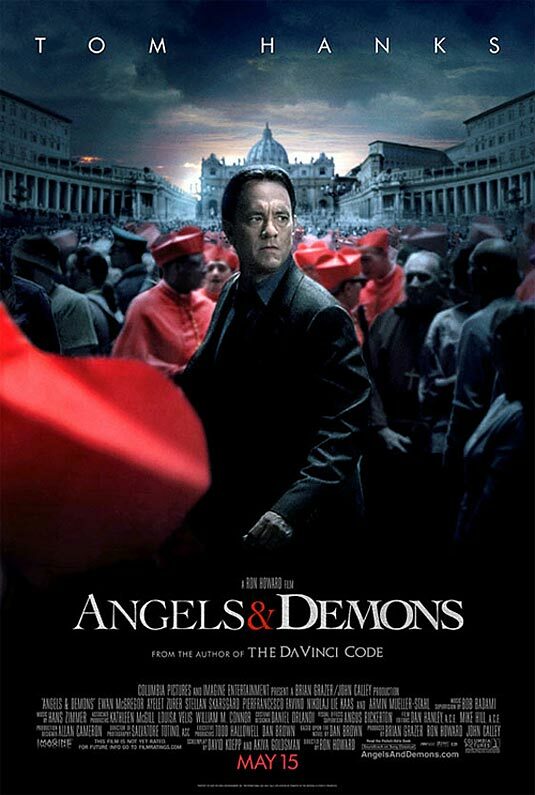 Some bizarre plot points aside, Angels & Demons is a decent thrilling ride through the breathtaking Rome. The movie begins with the death of the Pope and the gathering of the College of Cardinals to select the next Pontiff. However, before this happens, four of the most revered Cardinals are kidnapped and message left in their place. This leads the Church to turn to Langdon, a man with the knowledge of symbology that could help them track down those responsible. It turns out to be the return of the Illuminati, a scientific sect following Galileo that were hunted and killed by the Catholic Church. The Illuminati says that a cardinal will die every hour, and then at midnight Vatican City will be destroyed from an explosion from ‘antimatter’ stolen from CERN, a Swiss scientific facility. With the help of camerlengo Patrick McKenna (McGregor), acting church leader until there’s a new Pope, and particle physicist Vittoria Vetra (Zurer), Langdon must race against time to save the Catholic Church. With a cast of award winning actors, Ron Howard does a good job of directing a story that was easier to follow than The Da Vinci Code. Though not quite as expressionless as his first attempt as Robert Langdon, the considerable talents of Tom Hanks largely go to waste once again in this film, as his role is not fleshed out. Zurer’s character does little more than follow Hanks around from scene to scene and translate Latin and Italian for him. Ewan McGregor delivers a convincing performance as the quiet but knowledgeable Camerlengo. Overall, Angels & Demons is an entertainer. The interesting blend of facts and fiction makes the plot engaging. While the direction may not stand out, the cinematography is extraordinary as we travel through the picture perfect Vatican and Rome. A piece of advice: Go without expectations and you will be thoroughly entertained.